What is max degree of parallelism in SQL Server? SQL Server configuration option 'max degree of parallelism' limits the number of processors used for the execution of a query with a parallel plan. By default its set to '0' to allow all processors available. SharePoint 2013 requires that "max degree of parallelism" option be set to exactly 1 to ensure each request is served by a single SQL Server process. 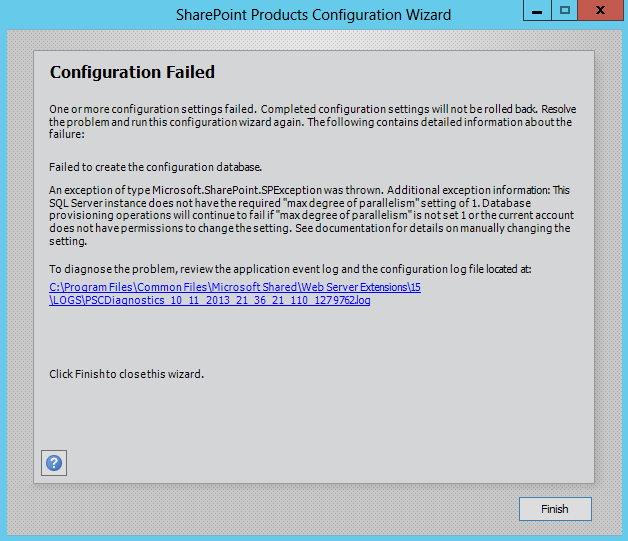 You may get configuration failed error in SharePoint 2013, if max degree of parallelism isn't set to 1. This SQL Server instance does not have the required "max degree of parallelism" setting of 1. Database provisioning operations will continue to fail if "max degree of parallelism" is not set 1 or the current account does not have permissions to change the setting. In SharePoint 2010 days, Maximum Degree of Parallelism option was recommended, but optional. But in SharePoint 2013, it is mandatory to set its value to "1" otherwise SharePoint configuration wizard will fail. Here is how to set the maximum degree of parallelism for SQL server instance. 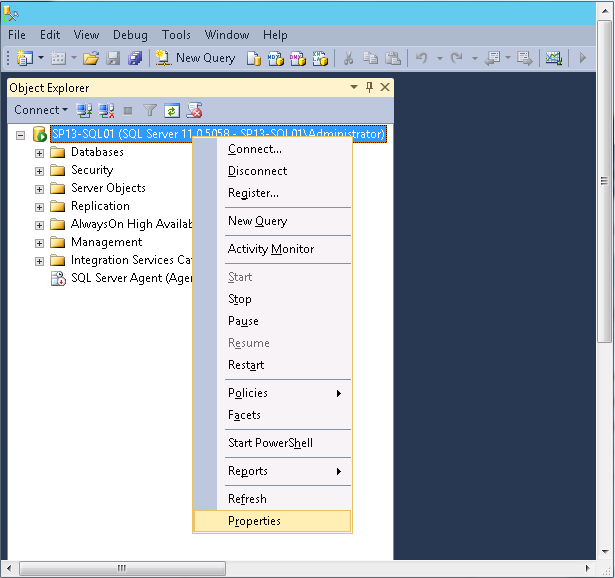 Go to SQL Management Studio and connect to the instance which hosts SharePoint databases. 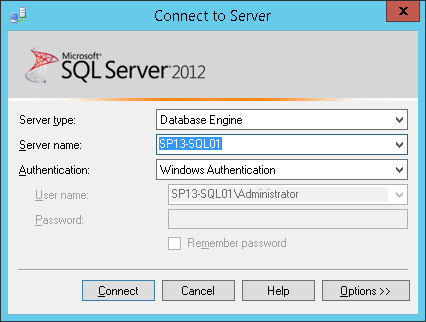 From the Object Explorer pane, Right click on the SQL Server and select Properties. Scroll to the bottom and change the Max Degree of Parallelism value from 0 to 1. Click 'OK' to apply max degree of parallelism setting in SQL Server 2012. If you are running the SharePoint configuration wizard with a user account that has sysadmin rights on SQL Server, max degree of parallelism will be automatically configured! 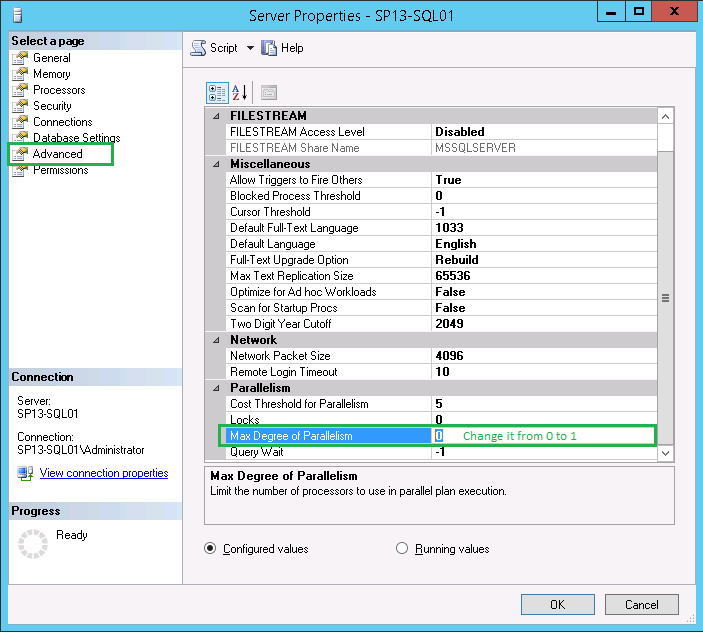 You can set max degree of parallelism option from Transaction SQL by running below code from SQL Server Management Studio.